Cough, cough, sneeze! You’ve probably been hearing a lot of this in your practice, as the cold and flu season grabs hold. The media prescribes all kinds of medications to suppress the symptoms, but as NES practitioners, protecting your clients from getting sick is much better than fighting symptoms once they appear. When we retreat indoors in fall, we reduce the amount of fresh air and sunshine we get, which also compromises the immune system. A further assault is indoor heating, which creates dryer air. This has a dehydrating effect on our mucous membranes, especially in the respiratory system. 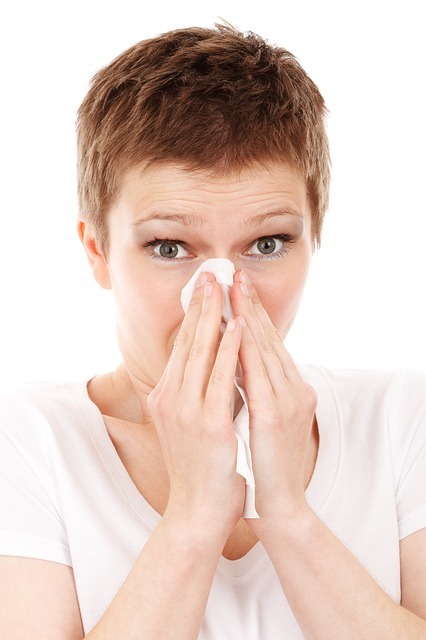 So how can we help our clients fend off colds and the flu? 1. Get sunlight for at least 15 minutes each morning, ideally between 10 AM and noon when we get the best light spectrum from the sun. This keeps us awake and feeling energized, so we feel happy instead of becoming depressed. 3. Don’t eat high glycemic index carbohydrates or sugar in the evening. Instead, have more herbal tea. Here is a suggested kit of Feel Good Infoecuticals that you can put together for your clients that can help boost their immune system. Source: The natural source for Source energy is fresh air, negatively charged, which we breathe and store in our kidneys. Suggest that your clients do breathing exercises, and try to get fresh air. When they can’t get outside, they can use Source energy as a replacement. CFI (Cold, Flu, Influenza): When your clients catch a cold or get the flu, tell them to start taking 15 drops of CFI a few times a day to get through it quickly. Day and Night may both be used to promote the right metabolism for day and night, especially during the times of the year when we are all indoors more and subject to a lot of artificial light. Also, remind your clients to drink enough water! 1. Polarity: Use this with clients who have many distortions in their body-field due to e-smog and air travel. It helps maintain a better charge in the body-field. 2. EMF: E-smog of any kind generally weakens the immune system and the heart, so EMF is beneficial for most people nowadays. 3. Peace helps your clients calm down after strong mental or physical exercise. 4. ESR and Chill may help your clients mitigate superficial and deeper emotional stress, to prevent weakening the immune system. 5. Heart Imprinter, sometimes combined with Nerve Driver, may help your clients deal with mental stress. 6. Female and Male: High levels of sexual hormones support vitality and a positive mood. Female and Male may help your clients with supporting these life forces. Of course, our Feel Good Infoceuticals are only part of a range of NES Infoceuticals that affect the immune system. There are many more. ED3 cell driver (Biocell on the miHealth), ED13, ED14, EI1, EI7, EI8, EI12, and all ETs, ES1 or ES5 which are used with a ProVision scan.